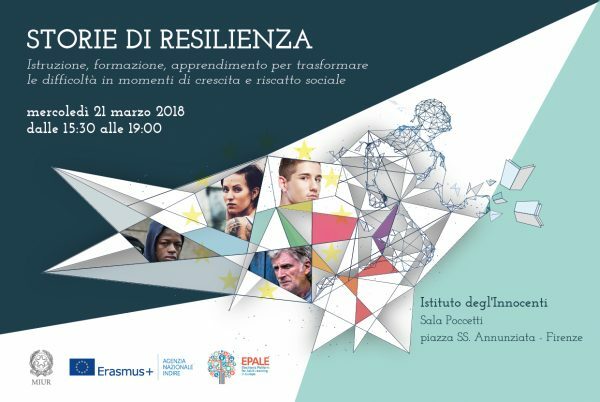 The Indire’s Erasmus+ agency and the Epale Italian unit joined the initiative of the European commission to create a network of positive role models who could inspire, with their stories, those living in difficult contexts, by enhancing trust in their capacity to make the most of difficult situations. The initiative is part of the measures of the European commission to support member states in combatting radicalisation and social discrimination, through the combined action of the competent authorities, society and collectivity at national and European level. In order to pool together testimonies of social redemption relating to education and training pathways, at the end of 2017 the call “stories of resilience” was launched, receiving positive participation with more than 70 short stories from migrants, refugees, youths at risk of early school leaving, prisoners, ex-prisoners disables and disadvantaged youths. These were different stories sharing a pathway to redmption where education and training played a crucial role. On 21 March in sala Pocetti of the Innocenti Institute (Piazza Santissima Annunziata, 12), Florence. The authors of the 25 selected stories will be presented and prized. During 2018 these people could become testimonials in schools, prisons, and institutes for adult learning and tell their stories as “role models” to inspire positive behaviours.